Hold little pieces of caricature art now. Commission our artist to draw a funny but very entertaining caricature from photo, which will be hand-drawn in colored pencils, from the photos, so you can spare your time . We draw caricatures in different themes. 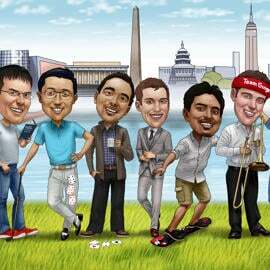 So, you can order a caricature featuring any sport activity, job, hobby. You can mention your own concept and our caricaturist will draw it in couple of days. It is necessary to describe background idea in the requirements box below or you can simply attach photo of it. You have to submit us with reliable sources, In order your caricature made a personalized gift for yourself, friend or family member. Caricature will be delivered as a ready-to-be-printed JPG File to Email. Additional delivery options at extra cost: original caricature drawing, caricature printed on canvas, caricature printed on canvas. Worldwide shipping is available for each printed item.